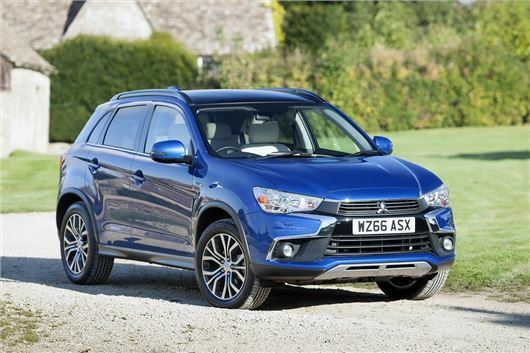 Mitsubishi has updated the ASX, with new exterior styling including a redesigned grille, plus new upholstery, new seat cushions and slight trim changes. Prices start at £15,999. The entry-level engine is a 117PS 1.6-litre petrol paired to a five-speed manual gearbox. This is joined by two diesel engines, the cheapest of which is the 114PS 1.6-litre DI-D. This comes with a six-speed manual and front- or all-wheel drive. In front wheel drive form it emits 119g/km and is officially capable of 61.4mpg. The top engine is a 2.2-litre diesel with 150PS, which comes with all-wheel drive and an automatic transmission as standard. There are four trim grades – 2, 3, 4, and 5. Basic ‘2’ models come with 16-inch alloy wheels, air conditioning, Bluetooth, a USB-port, electric windows and hill start assist. The ‘3’ trim costs from £18,349 and gains 18-inch alloy wheels, climate control, keyless entry and start, cruise control, auto lights, auto wipers DAB radio, Bluetooth for audio streaming, heated front seats and a reversing camera. ASX ‘4’ models cost from £24,249 and come with leather upholstery, black roof rails, a panoramic glass roof, a touchscreen system and navigation, while top ‘5’ models gain Nappa leather with colour-coded piping, premium carpet mats, heated rear seats and power driver’s seat adjustment. Prices start from £26,949. I had the previous model for a short time, 1.8 diesel. Great apart from the dangerous turbo lag at junctions. Looks like they haven't improved the power on the new ones, 114 BHP was a bit wimpy for a 1.8! Also, why do all 4x4 esque designs have the plastic trim around the wheel arches, it always colour fades after a few years? One good point of the old asx.